The Church of the Holy Sepulchre was perhaps the most disappointing “holy place” we visited because it has become a monument to the disunity of those who profess to follow Christ. How sad that the world-changing story of that victorious Resurrection is largely drowned out there. The Gospels tell us that Jesus was laid in a newly carved tomb owned by Joseph of Arimathea (Matt. 27:57-60). This tomb was in a garden area (John 20:15), near the Crucifixion place (John 19:41-42), sealed with a large rolling stone (Mk. 16:3-4). About 135 A.D., the Roman emperor Hadrian replaced these garden tombs with a temple to Zeus and covered the area of the Crucifixion with an altar to Venus. Two hundred years later, Constantine’s mother, Queen Helena, built a church over both sites, after verifying the place with the Bishop of Jerusalem whose predecessors had passed on that cherished information. The church was destroyed by the Persians (614 A.D.) and by an Egyptian Khalif (1010 A.D.) but was rebuilt both times. Today the site is marked by the huge, extremely ornate Church of the Holy Sepulchre, which is maintained by six Christian communities: Greek, Armenian, Latin (Roman), Syrian, Coptic and Ethiopian. The Greek and Roman contingents occupy large, prominent sections. The Syrian Church has a small, somewhat decrepit chamber; the poor Ethiopians have space on the bare flat roof. Inside, near the center of the vaulted, gold-decorated church, stands a huge, guarded shrine into which one enters through an antechamber to the place where there once was a tomb. The actual tomb, of course, is long since gone — as was its temporary occupant. 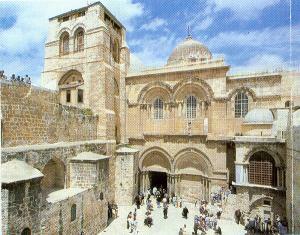 The Church of the Holy Sepulchre was perhaps the most disappointing “holy place” we visited. 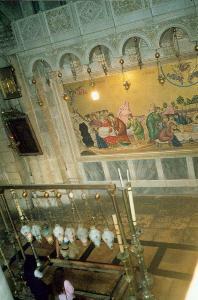 Not because of the exquisite tapestries and lavish gold overlays, or because of the Orthodox chanting or Roman incense. It was disappointing because it has become a monument to the disunity of those who profess to follow Christ. The public restrooms remain dirty and in disrepair because the churches cannot agree who will clean them. Denominational officials do not trust each other with the keys to the Church, which are entrusted instead to the care of two Moslem families. 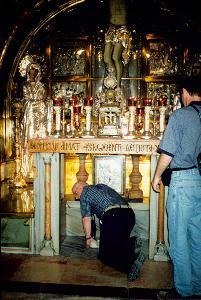 Most archaeologists agree that Holy Sepulchre Church does mark the spot where the Lord was briefly interred. How sad that the world-changing story of that victorious Resurrection is largely drowned out, in the ears of the onlooking Moslems and Jews, by the disagreeing din of Christians who fight over every slightest detail of the shrine that marks the place.